Blog > Training Courses > [Infographic] Why Should I Become a Performance Tester? 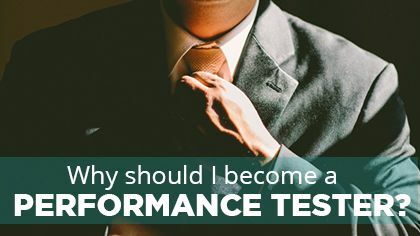 Is becoming a performance tester the right career move for you? Many people want to become a performance tester. First, let’s look at what it means to be one. That’s why performance testing experts are needed. Instead of hiring thousands of people to access the site at the same time and test it manually (something that would never happen due to outrageously high costs), performance testers use tools such as JMeter and BlazeMeter that simulate various situations of users on the site. A tester must be skilled in being able to simulate as closely as possible real-world load scenarios. The tools do their magic, but there is a world of a difference in the accuracy of the results when the tools are used by a trained professional. Why Should I Become a Performance Tester? As you can imagine, most industry-leading companies (or companies that want to have a chance to compete) hire performance testing experts in order to reduce these risks, optimize their applications (make them run faster), and improve customer satisfaction. Prospects for performance testers are looking good. As software companies are moving towards Continuous Delivery, performance is rising in importance and is becoming ever more the main focus within organizations. Now, everyone is responsible for performance, not just the QA department. New roles have emerged in recent years such as DevOps, which comes from a movement of people who care about developing and operating reliable, secure, high-performance systems at scale. According to Gartner, The average large US corporation experiences 87 hours of network downtime a year. Currently, testing accounts for 35% of the average company’s IT budget. The World Quality Report 2015-16 forecasts that by 2018 it will rise to 40%. 63% of respondents to the State of Testing Report 2015-2016 stated Performance Testing is a non-functional test that they typically perform and 55.2% indicated that they use Performance Testing tools like JMeter and BlazeMeter. Can an Online Certification Help Me Get Hired? Yes! Of the respondents to the State of Testing Survey 2015, 51.9% of organizations said that certification of competencies is one way that they improve the skills of their testers and 46.8% responded that one of the top areas for improvement is having more knowledge about the testing process. Here’s the best part, you can become a performance tester in your spare time. In just 4 weeks, (8 hours per week), you can get receive a certification in Performance Testing from Abstracta Academy so that you can start getting paid to do performance projects. With our course, you have the opportunity to study Performance Testing, learning from industry leaders how to use JMeter and BlazeMeter, ultimately gaining access to ample, better positions and career opportunities. At Abstracta, we have over 10 years of experience improving the performance of systems for companies like BBVA, EsSalud, Verifone, Genexus, the largest bookseller in the USA, and more. Throughout the years we have given many corporate training sessions to clients who want to learn the art and craft of Performance Testing for themselves. Now, we are making our knowledge available to anyone. You don’t even have to leave the house to complete our certification! Want to get a performance testing certification? Visit Abstracta Academy! Why is Performance Testing Necessary?